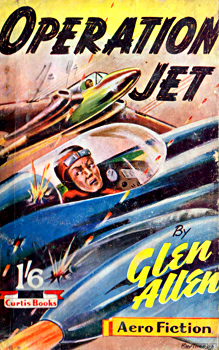 ALLEN, Glen : OPERATION JET. London : Curtis Warren, [ca.1950]. First edition. “There was something wrong with the old box of tricks that was stooging around way up in the blue there” – a title in the Curtis Warren “Aero Fiction” series. Crown 8vo (19cm). 112pp. Original pictorial stapled wrappers in a design by Ray Theobald; a little worn at extremities; some light marking and creasing; staples rusted; some spotting of edges and prelims, but a good and serviceable copy. No copy located in any major library worldwide. 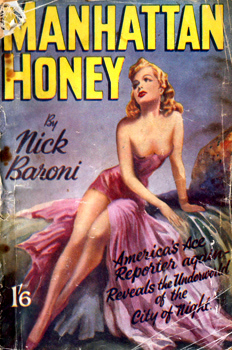 “BARONI, Nick” : MANHATTAN HONEY. London : Curtis Warren, [ca.1950]. First edition. “The young dame didn’t look like she ever ought a been in a place like Morelli’s. She was sitting on one of the high stools in front of the bar, twiddling the stem of the glass of stuff she had, trying not to look goggle eyed at the things she saw”. “Nick Baroni” was a Curtis Warren house-name, first used by Frederick Tom Foden (1907-1982) and subsequently by various other writers, but although over twenty “Baroni” titles are known, just one has been located in major libraries worldwide. Crown 8vo (19cm). 128pp. Original pictorial stapled wrappers; chipped at head and tail; wrappers a little worn, frayed and creased; staples rusted; text a little marked, spotted and tanned; a serviceable copy of a scarce book. No copy located in any major library worldwide. 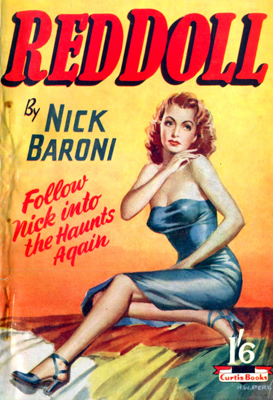 “BARONI, Nick” : RED DOLL. London : Curtis Warren, [ca.1951]. First edition. “I got a funny kind of a nose. I can smell dough a mile away. I can smell trouble, too. When I see the guy walk into my office in Chicago, I smell both ...” – “Nick Baroni” was a Curtis Warren house-name, first used by Frederick Tom Foden (1907-1982) and subsequently by various other writers. Crown 8vo (19cm). (1),[ii],4-111,[i]pp – including horticultural advertisements for both Flexible Earth and British Bamboo Groves. Original pictorial stapled wrappers – a soulful design by the always elegant H. W. Perl; some very minor wrinkling and creasing, with a single short nick; staples slightly rusted, with tiny spots of discolouration, but overall a very good copy. No copy located in any major UK library. 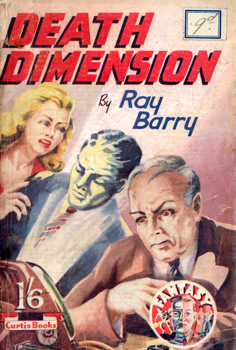 “BARRY, Ray” – [HUGHES, Denis Talbot, 1917-2008] : DEATH DIMENSION. London : Curtis Warren, . First edition. Robert Varden almost dies when his plane hits an electrical storm. When he awakes in hospital he has an invisible double. “An extraordinary and chilling fantasy” (Harbottle & Holland A244). Crown 8vo (19cm). 112pp. Original pictorial stapled wrappers – a design by Ray Theobald; spine worn and chipped at head and tail; wrappers a little rubbed and creased; price sticker on upper wrapper; some internal spotting and tanning, but a serviceable copy. Just a single copy (Liverpool) located in the major UK libraries. 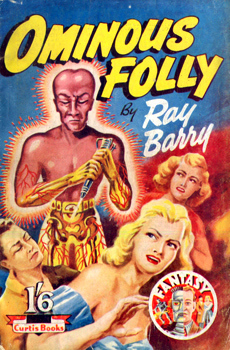 “BARRY, Ray” – [HUGHES, Denis Talbot, 1917-2008] : OMINOUS FOLLY. London : Curtis Warren, . First edition. Jane and Dinah take the Jaguar to Spain looking for adventure, ignore the fisherman’s warning, and take an ill-advised short-cut to another dimension. Crown 8vo (19cm). 112pp. Original pictorial stapled wrappers – a design attributed to Ray Theobald; some wear and creasing; staples rusted; a reasonable copy. No copy located in any major UK library. 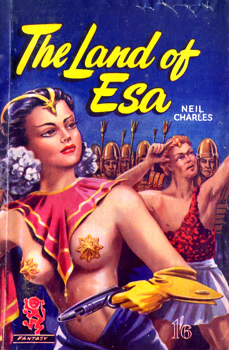 “CHARLES, Neil” – [HUGHES, Denis Talbot, 1917-2008] : THE LAND OF ESA. London : Curtis Warren, (1952). First edition. Naked, mysterious and well-educated young woman fished out of the Mediterranean – the presentation of a golden clasp leads to another time. Crown 8vo (19cm). 128pp. Original pictorial stapled wrappers – Prega in full dress (almost); some light wear, slight scuffing and minor creasing; staples rusting, with slight discolouration, but overall still a very good copy. No copy located in any of the major UK libraries. 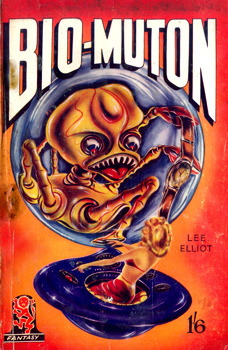 “ELLIOT, Lee” – [HUGHES, Denis Talbot, 1917-2008] : BIO-MUTON. London : Curtis Warren, (1952). First edition. Scientists on an isolated island try to create a living entity from a synthetic biological structure, accidently opening a window in time and exposing themselves to the Forces of Darkness. The Watchers come to the rescue. Crown 8vo (19cm). 128pp. Original pictorial stapled wrappers – a design attributed to Gordon Davies; worn at foot; a little rubbed and darkened; staples rusted and discoloured, but overall a good copy. Just a single copy (British Library) located in the major UK libraries. 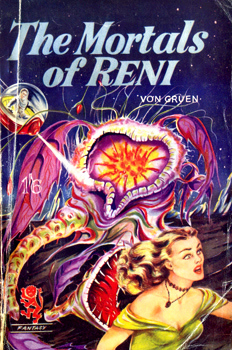 “GRUEN, Von” – [HOLLOWAY, Brian] : THE MORTALS OF RENI. London : Curtis Warren, (1953). First edition : the wrappers issue. The long-established Earth colony on the planet Reni has to be evacuated when its sun fails, abandoning the gentle and trusting Renians to their fate – but some Earth mortals decline to leave. Crown 8vo (19cm). 159,[i]pp. Original pictorial stapled wrappers – an unsigned but typical design by Gordon C. Davies; a little rubbed and creased; staples a little rusted; text a little tanned, but a good copy. Only a single copy (Liverpool) located in any major UK library. 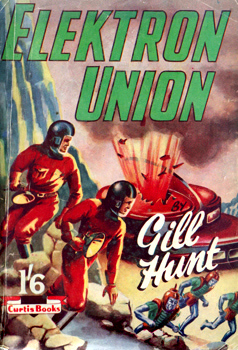 “HUNT, Gill” – [HUGHES, Denis Talbot, 1917-2008] : ELEKTRON UNION. London : Curtis Warren, . First edition. Newly opened space-route between Earth and Tanus, ships disappearing, convoy lands on alien planet – “Another of the atrociously-written space operas by Hughes, essentially a transplanted western” (Harbottle & Holland). Crown 8vo (19cm). 112pp. Original pictorial stapled wrappers – a design by Ray Theobald; small chip at head; slight split at foot; minor wear at foot; some slight creasing; a few spots, but a very good copy. Just five copies located in major libraries worldwide – just one (British Library) in the United Kingdom. “KENT, Brad” – [HUGHES, Denis Talbot, 1917-2008] : CATALYST. London : Curtis Warren, . First edition. Writer and anthropologist moves to a remote cottage on Dartmoor – strange girl without memories found on the moor is frightened of the blue lichen. “This story marked the start of Hughes’s transformation from ‘straight-SF’ hackery to intriguing science-fantasy” (Harbottle & Holland A261). Crown 8vo (19cm). 112pp. Original pictorial stapled wrappers – a design attributed to Ray Theobald; small chip at foot of spine extending to lower wrapper; some creasing to lower wrapper; staples a little rusted, but overall a very good copy. Just four copies located in major libraries worldwide – none in the UK. “LE PAGE, Rand” – [BIRD, William Henry Fleming, 1896-1971] : WAR OF ARGOS. London : Curtis Warren, (1952). First edition. 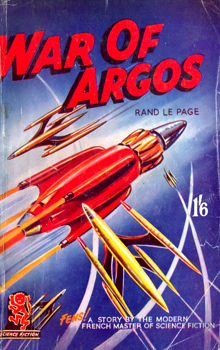 “A story by the modern French master of Science Fiction” runs the strapline, although the eight or so “Rand le Page” titles produced by Curtis Warren all appear to have been written by British authors, in this instance by William Bird. 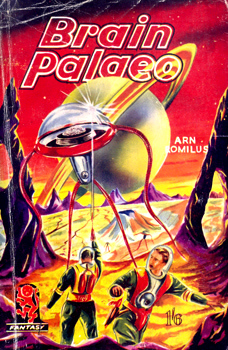 The planet Argos has been under the Earth’s control for centuries, but now there is an uprising fuelled by telepathy. Crown 8vo (19cm). 127,[i]pp. Original pictorial stapled wrappers – an unsigned design attributed to Gordon C. Davies; wrappers slightly chipped at head; a little worn and creased; staples rusted, but a good and serviceable copy. Just a single copy (Liverpool) located in the major UK libraries. 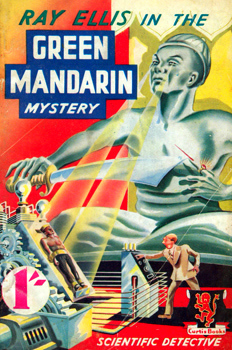 “MALCOM, Grant” – [HUGHES, Denis Talbot, 1917-2008] : RAY ELLIS IN THE GREEN MANDARIN MYSTERY. London : Curtis Warren, . First edition. “A scientific detective story. Ray Ellis is asked to find why a number of top scientists have dissapeared ... plot to take over the world ... superior to anything else that Hughes wrote during this period” (Harbottle & Holland A266). Crown 8vo (19cm). (128p). Original pictorial wrappers in a design by Ray Theobald; some nicks and creases; rear wrapper chipped at corners, without loss of text; test tanned and a little brittle, with nicks and corner chips to final leaves, again without loss of text; a serviceable copy of an uncommon title. Just two copies (Liverpool and Paley) located in major libraries worldwide. “REED, Van” – [HUGHES, Denis Talbot, 1917-2008] : HOUSE OF MANY CHANGES. London : Curtis Warren, (1952). 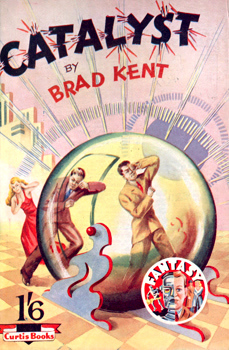 First edition : the wrappers issue. “When creation which is contrary to all the accepted laws of Nature springs directly from Genius in the grip of Evil the results may well take a form so terrible as to be beyond human understanding ...”. 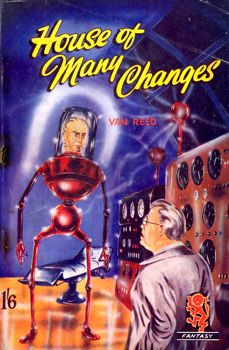 Mad scientist, laboratory horror, allegorical fantasy – “charmingly bizarre” (Harbottle & Holland A268). Crown 8vo (19cm). 128pp. Original pictorial stapled wrappers – a perplexed design attributed to Gordon C. Davies; chipped at head (2cm), with minor chip at foot; some rubbing and light creasing; staples badly rusted; a serviceable copy. No copy located in any major UK library. “ROMILUS, Arn” – [HUGHES, Denis Talbot, 1917-2008] : BRAIN PALAEO. London : Curtis Warren, (1953). First edition. Telepathy developed, but a time-space gap opens up and an evil half-brain, half-robot, life form is listening in. Crown 8vo (19cm). 159,[i]pp. Original pictorial stapled wrappers – a design attributed to Gordon C. Davies; short split at head; some rubbing and creasing; staples rusted, but a reasonable copy. Bookseller stamp of McGills, Elizabeth Street, Melbourne, on title-page. No copy located in any major UK library. “VANE, Brett” : SMART HUSSY. London : Curtis Warren, [ca.1951]. First edition. “I couldn’t tie that dame up with Lisell anyhow. She’s just a chorine. He’s a crook, a big time crook, and me, I’m Bat Scrimms, burlesque agent, I been a lot of other things as well, but I’m aiming to forget them now” – “Brett Vane” was a Curtis Warren house-name, first used by Frederick Tom Foden (1907-1982) and subsequently by various other writers. Crown 8vo (19cm). 128pp. Original pictorial stapled wrappers; lightly worn; small chip, slight creasing, and faint inked price to upper wrapper; lower wrapper and least leaf a little soiled and spotted; staples lightly rusted; light spotting of edges, but a good copy of a difficult title. 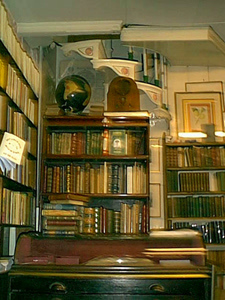 Although fifty or so Brett Vane titles are known, over half by Foden, only a handful of them have been located in the major UK libraries. No copy of the present title has been located in any major library worldwide.